Here's to make-ahead summer suppers. Combining sale ingredients (75-cent organic ricotta!) with garden vegetables. 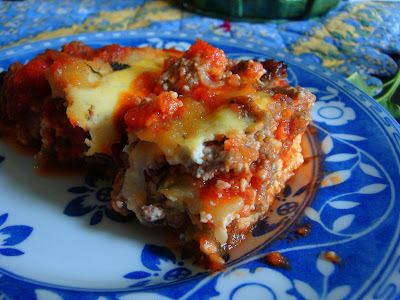 A lower carb lasagna which uses the last 2 zucchini? A win! Recipe from The Italian Dish, inspiration from Happy To Be Called Mommy. Very cool! I miss having overflowing zucchini. Mmm. Looks amazing! Care to share the recipe?! Absolutely lovely. Last night we returned home from almost a week out of town. I played Iron Chef, clean out the fridge style and came up with a wanna-be Asian slaw with terriyaki scallops. It was wonderful, especially after several days of a less than stellar diet. 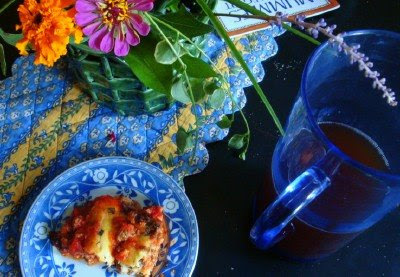 You can click on the link to the Italian Dish to see the recipe I adapted. I rarely post the recipe myself because I get nervous about wasting someone else's ingredients with a mistake or a bad result. I basically followed her recipe only adding a ground beef layer and not using so much mozzarella. I love the creativity of inexpensive, improvised dinners! oh my goodness. I have to make this sometime soon. Yum! I was just thinking of making some lasagna - I think you've talked me into it:) I've been cooking quite a bit to try and stock the freezer before baby gets here. It is so good to have meals (or even just parts of meals!) in the freezer! It sounds delish. And that first picture is so pretty! .75 for ricotta - where have I been? the table runner is very pretty, I love blue and yellow like summers in Provence! Love using up those bits of veggies in a dish like that! Sounds yummy! Since it's been a scorcher here, I've been really happy with my crockpot - Oven off for a week plus... Got a lasagna crockpot recipe perhaps? Your improvised dinner looks amazingly delish! That looks absolutely delicious! What a great substitute! Yummy, I am coming over with a fork! Yum! I just found your blog and I love your title. My blog is "Striving for 31". I love all things that pertain to being a 31 woman. I can't wait to read more. zucs are, i find, the secret ingredient in lots of yummy summer recipes. :) thanks for sharing a link to the recipe. Sounds and looks great! We have a huge zucchini from the harvest table at church that my daughter just had to have. Now I have another idea for using it up! I also like to do an italian meatball soup with zucchini in it. Hmmmm...I have garden zucchini and tomatoes. This simply inspirational!